Racing craft filled the Point Hudson Marina in Port Townsend on Wednesday, the eve of the fourth running of the Race to Alaska. The starting gun fires bright and early Thursday morning for the fourth annual running of the maritime Race to Alaska. The 750-mile adventure marathon has been compared to the Iditarod but with a chance of drowning, being run down by a freighter, or getting eaten by a grizzly bear. 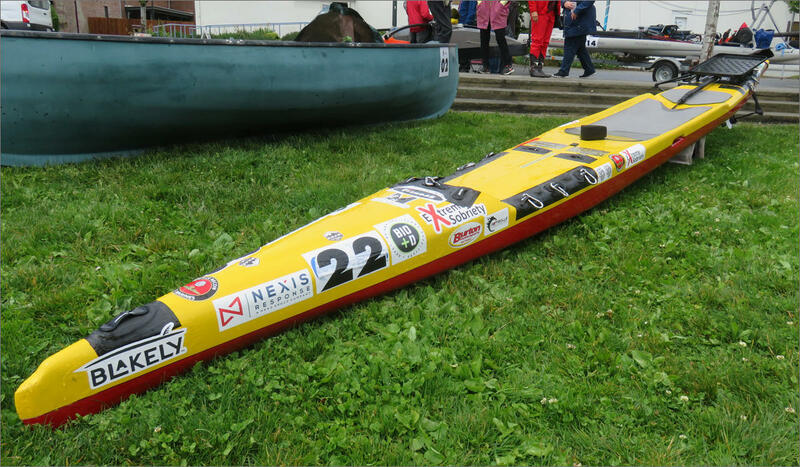 Any size boat with any size crew can compete in the Race to Alaska as long as it has no motor and can get to Ketchikan self-supported. Entries range from cabin-less catamarans and comfortable trimarans, to daysailers, rowboats, several kayaks and paddleboards. 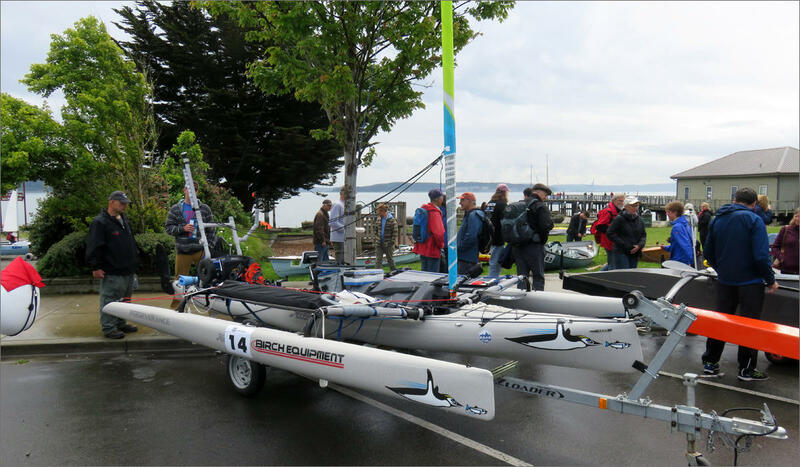 The Race to Alaska begins with a qualifying stage from Port Townsend to Victoria and then around three dozen teams begin racing in earnest on Sunday up the Inside Passage to Ketchikan. Race co-founder Jake Beattie of the Northwest Maritime Center, the race’s nonprofit organizer, said he never ceases to be amazed by the human spirit the watery marathon draws out. “There are incredible human stories in this one, I mean no shortage of them,” Beattie said. There’s the “prone paddler,” ex-U.S. Marine Steve Rhoades plans to stroke to Alaska on a 20-foot paddleboard using only his gloved hands. The 64-year-old from Bainbridge Island hopes to use the feat to draw attention to homelessness and as a fundraiser. Prone paddleboarder Steve Rhoades of Bainbridge Island wants to stroke this 20-foot paddleboard using only his gloved hands all 750-miles of the Race to Alaska. And then there’s Doug Shoup who is competing solo under the apt name of Team Perseverance in an 18.5-foot Hobie Mirage Island sit-on-top kayak with outriggers and sail. Doug Shoup hopes this 18.5-foot Hobie Mirage Island will carry him all the way to Alaska. Skipper Jeanne Goussev of Bainbridge Island leads the all-female crew of Team Sail Like A Girl. As she and her crew were doing last minute outfitting of their 32-foot “buoy racer” on the eve of the competition, Goussev said she signed up for the sheer challenge and to promote women in sailing. 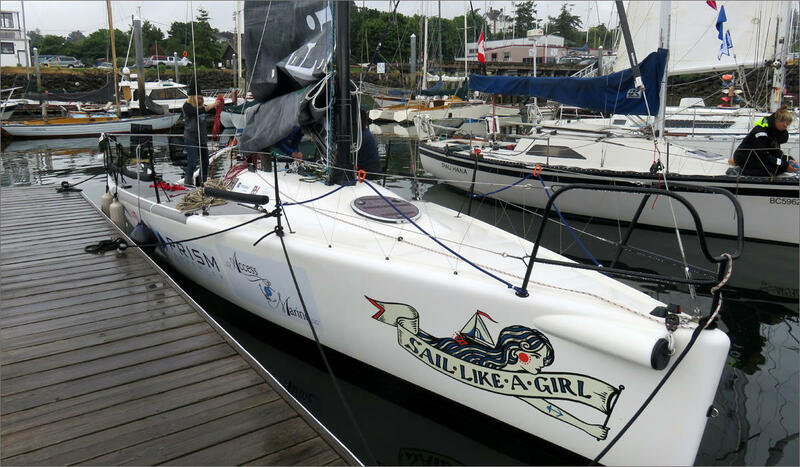 Team Sail Like A Girl will set out with an eight-member crew from Port Townsend, Washington. Competitive cyclist Matt Johnson of Seattle is aiming to be the first to complete the race using pedal-power alone. He’s doing the race solo in a home-built boat that resembles a recumbent bicycle with outriggers connected to a propeller. Johnson said he figures it will take him 10 to 16 days to pedal to the finish line. Matt Johnson, right, of Seattle plans to pedal all the way to Alaska in this 20-foot home-built boat. The pedal-driven propeller can be seen to the left of Johnson's feet. Previous winners have used racing catamarans and trimarans to sail day-and-night to reach Ketchikan from Victoria in around four to five days. As in year’s past, the top finisher earns $10,000. Second prize is a set of steak knives. This year featured a new warm-up to the maritime marathon, a shorter Puget Sound race dubbed “the spawn of the Race to Alaska.” The official name for the new event, which ran from Monday to Wednesday, was SEVENTY48. As the name implies, entrants had 48 hours to navigate the 70 miles between Tacoma and Port Townsend. Only human-powered craft were permitted, unlike the parent event where engine-less sailboats dominate. A team composed of four-time Olympic kayak medalist Greg Barton and paddling partner Kevin Olney captured the $11,700 winner-take-all purse in the inaugural running. 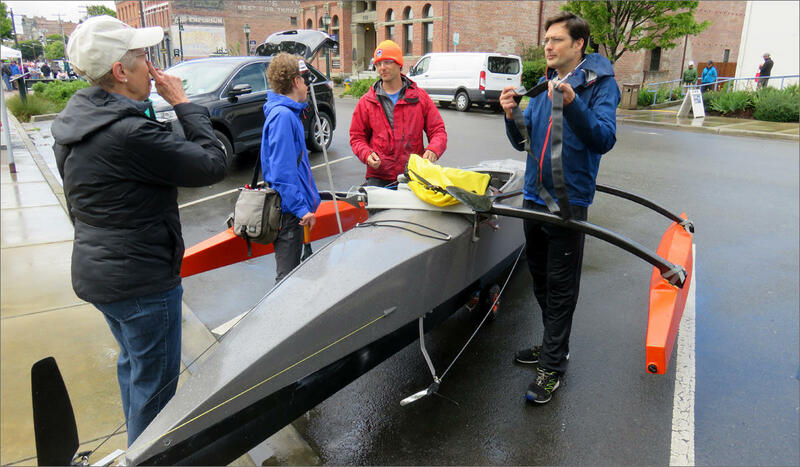 They used a long, narrow, lightweight “surf ski” to traverse the course along the west side of Puget Sound in 9 hours 39 minutes, which represents an average speed of over 7 miles per hour. Evans said the SEVENTY48 race drew 117 teams in all, which is one of many reasons he believes it will be a repeater. UPDATE, June 14, 9 a.m.: Prone paddler Steve Rhoades exited the race early on the first day and returned to the beach in Port Townsend. He told a race monitor that it would be unwise to continue after he re-aggravated past hip and shoulder injuries. An Orcas Island, Washington, man has become the first person to complete the Race to Alaska on a standup paddleboard. Karl Kruger stroked 750 miles solo from Port Townsend up the Inside Passage, crossing the finish line in Ketchikan Sunday evening. You probably have seen standup paddleboarders along your local shoreline. But can you imagine paddling one of those boards for 750 miles up the Inside Passage to Alaska? The madcap flotilla of engineless boats entered in the Race to Alaska is safely moored in Victoria. Stage one of the 750-mile adventure race from Port Townsend, Washington, to Ketchikan is in the books. It was so memorable they had to do it again. The 750-mile Race to Alaska is back for a second year as 43 teams of sailors, rowers and paddlers prepare to set off from Port Townsend, Washington at 6 a.m. on Thursday. A steak-knife fight on the high seas has captivated Northwest yachting fans for the past day. The first stage of the inaugural 750-mile Race to Alaska -- a non-motorized endurance race up the Inside Passage -- has thinned the field. A souped-up paddle board, custom rowing craft and high performance, carbon fiber sailboats are just some of the eye-catching entries in the inaugural Race to Alaska.